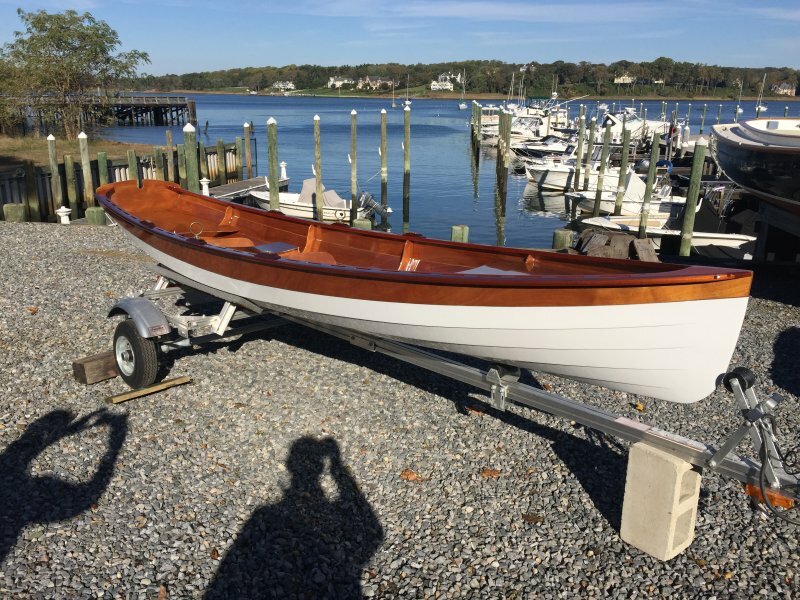 MORNING WOOD is a Chester Yawl I built from a Chesapeake Light Craft kit (CLC). She was slow in the making as I acquired the Whitehall kit in 2007. The box followed me through several moves and I started working on her in 2014, a few hours here and there, schedule permitting. I received assistance from my friend Bill Caldwell with the scuppered inwales, as well as fixing some hatch booboos. Jim Cerruti from Fair Haven Yacht Works helped me with an Awlcraft 2000, two-part polyurethane from Awlgrip and eight layers of varnish for the brightwork. She has three oarlock stations and a second set of floorboards for a Piantedosi sliding row seat. Of course, I have to mention the outstanding customer support from CLC as well as the beautiful design work from John C. Harris and the overall outstanding kit quality. I am looking forward to years of enjoyment with this boat.